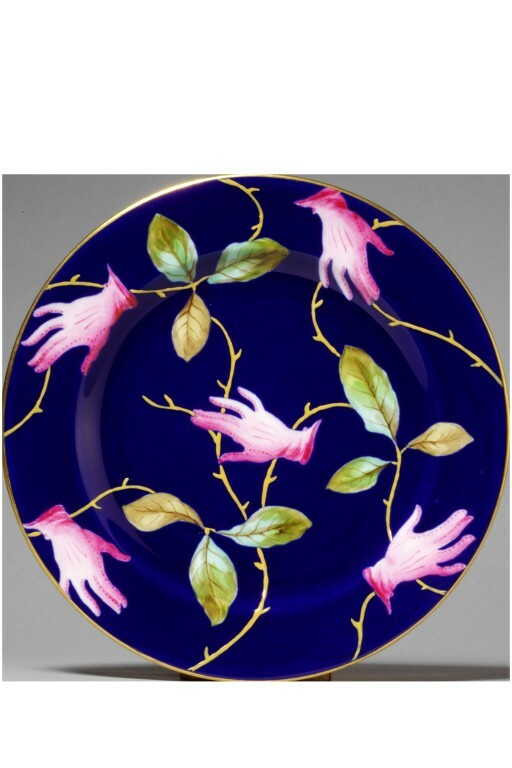 Plate, decorated with a blue ground and painted in enamels with pink gloved hands and trailing foliage. Printed factory mark comprising a crown and interlace design, surmounted by 'ROYAL CROWN DERBY', below which, 'MADE IN ENGLAND' and 'II', the latter the date code for 1939. 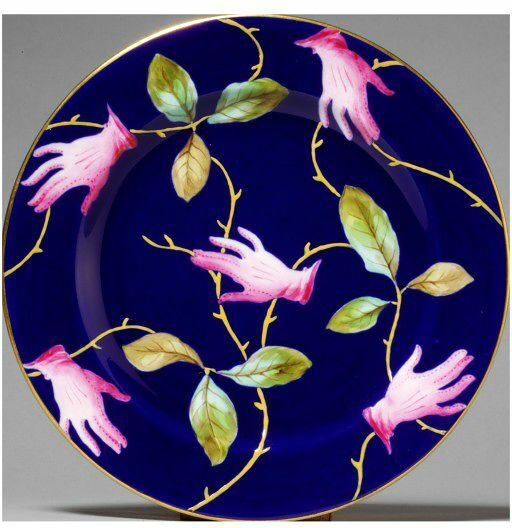 This unique service was commissioned from Royal Crown Derby by the poet, artist and patron of Surrealism, Edward James, for his extraordinary Surrealist house Monkton. In 1936 Salvador Dali stayed with Edward James at his London home, where they developed a number of ideas for surrealist objects and furniture. In a previously unknown correspondence between Edward James and the decorating firm, Green and Abbott from 1938, the 'pink glove tea set' is mentioned in the same context as the famous torso chest of drawers, the lobster telephone and the Mae West Lips sofa, all of which are known to have been conceived by Dali. It is highly likely that Green & Abbott also adapted an original motif by Dali and supplied it to the manufactory for use on a standard porcelain service. Much of the Edward James estate was dispersed in the 1980s and a large number of the major paintings and decorative works are now in the collection of the Museum Boijmans Van Beuningen in Rotterdam. The Art Institute in Chicago and the Tate also have important works. This tea set was sold at a sale of the Edward James Collection at Christies in 1986. It was acquired by John Jesse, and subsequently bought by the museum at the sale of his collection at Sotheby's, New Bond Street on Wednesday 22 February 2006. Side plate, blue ground with pink gloved hands, Royal Crown Derby, 1938-39.